If you like to use cotton pads for facial cleansing, consider switching to organic cotton that way you will eliminate traces of harmful pesticides. However, there is another alternative to the disposable cotton pad. Love the Planet have been on my radar for some time and of course I have seen other bloggers mention the company. I recently accepted an offer to review their washable cleansing pads. The concept behind these is an eco friendly alternative to cotton wool. Personally, I use very few cotton pads because I favour muslin cloths but I know from watching beauty blogger videos that some people appear to go through packets per month. Love The Planet’s cleansing pads are a nice size and are very soft. I have mainly been using them to remove my cleanser and clay mask. You can use them dry but I do dampen them in warm water. If you are not a fan of flannels or muslin cloths then these may be an ideal solution for you. The pack contains five pads and comes with a wash bag (priced at £6.20). I hung the wash bag in my bathroom and collected used pads over a few days, and then I simply threw the bag into the washing machine with my towels. I washed them at 60 degree (I know this is frowned upon but high temperatures kill germs) and they came out a good as new, no trace of makeup. Love the Planet also offer a skincare range which is free from parabens, mineral oils, artificial colours, artificial fragrances, animal testing, animal products and sodium lauryl/laureth sulphate. 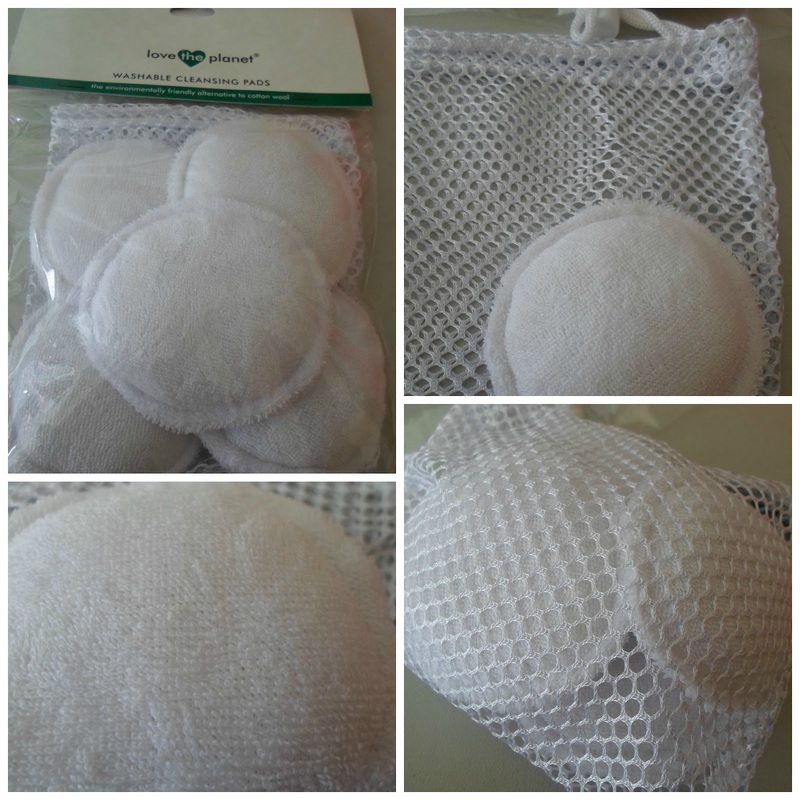 What do you think of reusable cleansing pads? Have you tried this product or any others from Love The Planet? Wow that's awesome! I'd buy it but i just use cotton pads for removing my nail polish and that wouldn't wash out..But this would be something for all those "beauty gurus" on YT who use 2 or 3 pads just for removing their eye makeup which really annoys me! Would love to try those! This looks great! I've gone back to using cotton pads the past couple of months for my eyes and for my toner but I feel so guilty for the waste! These could be promising...do you reckon they're gentle enough for around the eyes? Really smart with washable cleansing pads, - I may try this. I don't use wet wipes to clean my little son either, because I'm afraid of the chemicals. Much better with only water! Like you, I'm very found of Deep Steep. Have you tried their shampoo? I would like to try that when I have emptied the shampoo that I use now. I have these and absolutely adore them! I find that they're more gentle than a flannel or muslin too. I normally just use a washcloth, but I like the idea of these. OH I really like this idea. I need to try them. Ahh beginning to see these everywhere! I don't use lots of pads but I use 2-3 a night so I'd have to have like 3 sets of these for it to work for me! :( I know the initial cost is low compared to what I'd buy in terms of cotton wool pads but argh. It's that first step!